Campaign for a Commercial-Free Childhood: Back to school with PepsiCo stealth marketing? I recently blogged about questions regarding how PepsiCo's voluntary beverage guidelines, announced in March, would be implemented in schools given that contracts are made at the local level. Now with back-to-school in full swing, I have even more questions about how PepsiCo may be using stealth marketing techniques to gain access to that coveted captive K-12 audience. PepsiCo's Frito-Lay North America business unit kicks-off high school football season with the "Score for Your School" program for Texans only that invites fans to help schools win up to a $10,000 donation for their sports programs. Beginning today, Texas fans can visit www.scoreforyourschool.com, enter the 9-digit product code from ANY Frito-Lay product (chips, dips, salsa and more) and then select the Texas high school of their choice. So in order to even vote for your school, you have to purchase a product. How nice of Frito-Lay to "invite" fans to buy Fritos, Doritos, Tostitos, Cheetos, Lays, etc. But it's "ANY" product, so generous! Why just Texas schools? The company's marketing guy explains: "Frito-Lay snacks and high school football are a Texas tradition," said Michael Del Pozzo, director, marketing, Frito-Lay North America. As high school sports programs face many challenges, we thought this promotion would be an easy and fun way for fans to help. Now, each single purchase can add up for a chance to win up to $10,000 for their school when they go online and 'Score for their School'. How thoughtful of Frito-Lay to create a fun and easy way for fans to help sports programs. Couldn't have anything to do with how many more chips would get sold would it? Because if the company really cared, how about just sending a check to each Texas high school football team instead? This program, which runs through December 31, is capped at $90,000 in donations, a drop in the bucket for the nation's largest salty snack purveyor. But this marketing-disguised-as-philanthropy is by now old territory for PepsiCo. For the past year, the company has been gaining much positive PR with its ubiquitous Pepsi Refresh donation program. If you're like me, you've been annoyed by friends and colleagues begging you to vote for their nonprofit or other worthy cause, like a high school popularity contest. The highlight of the 15-minute assembly in the gymnasium came when Father Delix Michel riled up the youngsters with a T-shirt toss. Similar to professional baseball games - but minus the slingshot - Michel showed a good pitching arm as he deftly threw Pepsi shirts to all areas where students were sitting, including landing one shirt in the back row. Some of the shirts landed in the students' laps. A priest handing out Pepsi T-shirts, it doesn't get any better than that for positive PR. Now it's great that PepsiCo wants to give back to the community, but there is only one word for this and it's not philanthropy, it's branding. It's sad that schools feel they must participate and don't see through it. 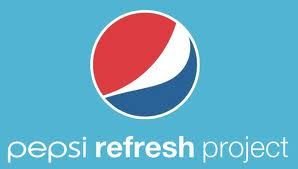 The Pepsi Refresh website has an entire section devoted to education. Please let us know if your school is involved in either of these stealth marketing campaigns. Pepsi does not belong in schools, whether it's soda vending machines or voting contests. while i wholeheartedly agree that this is shameless marketing to kids, schools are in the unenviable position of having to seek out / accept funds from pretty much wherever they can. Great post, Michelle. I'm a TX native, and I'm extremely concerned about childhood obesity and marketing of unhealthy products to children, particularly in areas of society like schools, that are supposed to be safehavens for children. I'm wondering if the previous comment is supposed to somehow excuse Pepsi for marketing in schools? Does Corporate Social Responsibility somehow excuse Pepsi and other junk food purveyors for aggressively marketing to children, who don't even understand marketing's persuasive intent? Does their CSR excuse them from building loyalty among parents and teachers, the very group that should be most concerned about how their marketing techniques circumvent their efforts to make healthy choices for their kids? The answer is a resounding no. Get junk food marketing out of schools, support efforts like www.retireronald.org, and bolster the FTC's power to regulate marketing of unhealthy products to children.